Dark-Matter Mystery: Why Are 400 Stars Moving as if There's Nothing There? The theory of dark matter took decades to take hold in astronomy, and no wonder. It's pretty tough to wrap your mind around the notion that some mysterious, invisible substance pervades the cosmos  and even tougher to accept that it outweighs ordinary matter by a factor of 6 to 1, at least. Evidence eventually trumped incredulity, though, and by the 1980s, the vast majority of scientists were on board with the idea, nutty though it might seem, and there they've remained ever since. But a new study out of the European Southern Observatory claims that this now established theory could be in trouble. Chilean astronomers took a look at the motion of 400-plus stars in the broadly defined neighborhood of the sun and concluded that the way they're all moving is inconsistent with conventional ideas about dark matter. "Our calculations show that [evidence of dark matter] should have shown up very clearly in our measurements," said Christian Moni-Bidin, of the University of Concepción, in a press release. "But it was just not there!" This could indeed be a blow to dark matter  in principle, anyway. Looking at the motion of visible matter to deduce the presence of dark matter is, in fact, the way the shadowy stuff was first detected. It was back in the 1930s that Caltech astronomer Fritz Zwicky initially noted something very odd. He could tell that the individual galaxies in galactic clusters were orbiting around each other like swarming bees. But they were moving too fast  at a speed that, by rights, they should have flown away from one another. His crazy-sounding explanation: the extra gravity of dark matter (he called it "missing mass") was binding them together. Nobody paid much attention at the time, but later studies of individual galaxies like the Milky Way showed that their pinwheel-esque rotation was also too fast. The galaxies seemed to be surrounded by dark matter, the way a butterfly is surrounded by the glass in a paperweight. Exactly what dark matter was made of has still eluded astronomers. Multiple lines of evidence strongly suggest that it's a still undiscovered type of subatomic particle  and if that's true, it's not just out there, it's right here as well. Dark-matter particles should be passing through Earth all the time (physicists are trying to detect them even now), swirling about the solar system and filling the space between the stars. The particles of dark matter in the room you're now sitting in would be far too few to have a gravitational effect on anything, and so would be the ones filling the solar system. What Moni-Bidin and his colleagues claim in their new study is that the effect that should be showing up at the next level  specifically, in a sphere about 13,000 light-years in radius surrounding the sun (by point of comparison, the closest stars, in the Alpha Centauri system, are about 4 light-years away). They looked for stellar motions induced by this nearby dark matter, and just didn't find any. "The amount of mass that we derive [from those motions] matches very well with what we see  stars, dust and gas  in the region around the sun," Moni-Bidin said. In short, there's no dark matter in this neighborhood. If Moni-Bidin and his colleagues are right, that suggests that while dark matter undoubtedly exists, it isn't in the form of the particles physicists are looking for. It's something else, distributed in a different sort of way from anything anyone has imagined. And if that's the case, the physicists trying to detect those particles are wasting their time. If that's the case. The catch is that not everyone is convinced, or even that dark-matter theorists should be very concerned about the new findings. "It's very difficult to measure the local density of dark matter," says David Spergel, head of the Astrophysics Department at Princeton. "[The technique the Chileans used] is a method that has historically been plagued with problems." 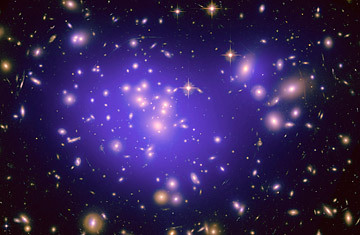 Beyond that, he says, several different, independent techniques have all come up with different results from those of the recent study, and all are more or less consistent in terms of how much dark matter there is and how it's spread around. That's pretty convincing evidence that the current consensus is close to being right and that this one discordant measurement is wrong. "I suspect," Spergel says, "that the problem lies with either the analysis of local data or with models that predict the local (as opposed to the global) dark-matter density." Or as scientists often say when confronted with data like these: important if true. But probably not true.